Break away from the crowds and travel through untouched meadows and forests of Aspen and Pine. Fun for all ages, view wildlife in its natural element and take in the breathtaking Colorado landscape. Witnessing sled dogs in their true element is a once-in-a-lifetime experience. Take a snowy journey through time with a dog sled tour in the mountains of Colorado. Experience transportation dating as far back as the tenth century, and learn about the dogs and surrounding areas from your experienced dogsled guide. Cozy wool blankets are provided but dress warmly. You may even want to bring your goggles in case of inclement weather. Dog sledding books up far in advance due to its limited availability. Morning and afternoon adventures are available for booking. Transportation, snack and hot beverage are included. 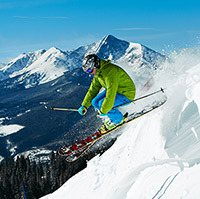 Contact your East West Hospitality Concierge to learn more and to make reservations for this unique Vail adventure.